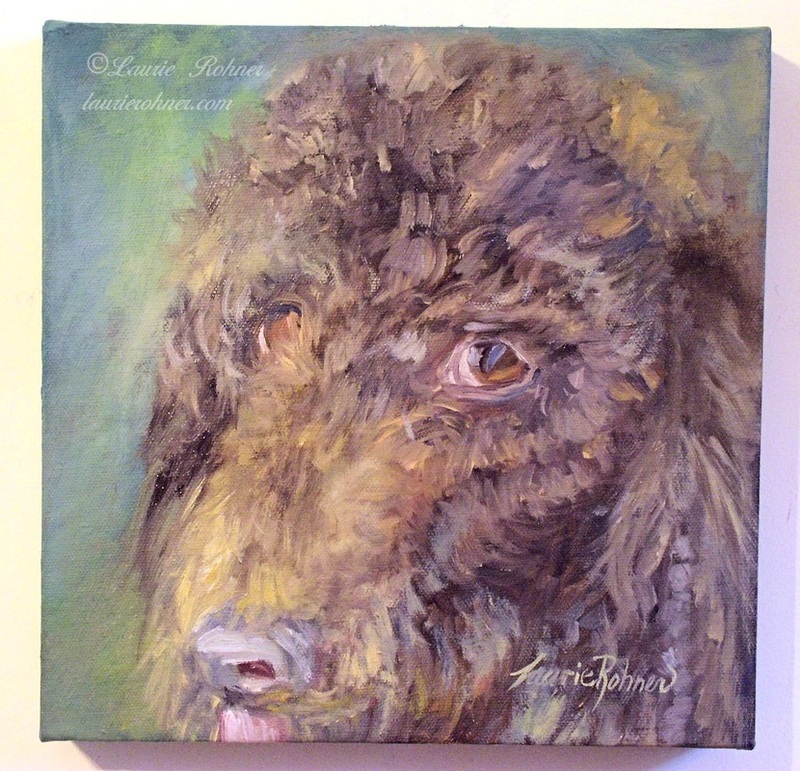 Pet portraits paintings of dogs and animals are original oil on canvas art by artist, Laurie Rohner. Contact me for your custom painting today. I've got a secret, have you heard? New Brown Lab Painting in studio shop at Between The Weeds. Bulldog oil painting titled Heart of Gold. 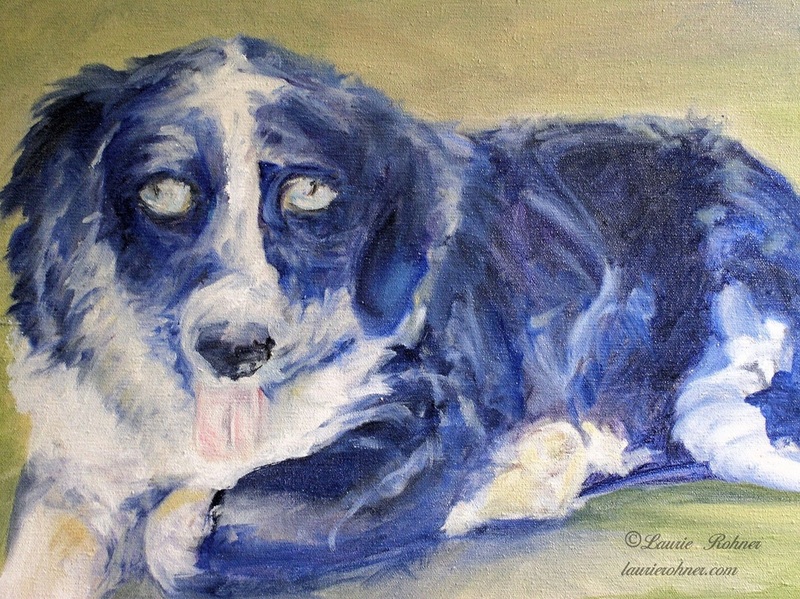 Pet portrait is a custom painted oil on canvas original painting of your beloved dog. You take the photos and I will work a painting of the dog. The image has to be high resolution. I capture the emotion of the dog so having a good clear photo of your dogs expression is needed. To start the process I require 25% of the payment. Send me your photos (I return everything you send me) they have to be good quality jpeg file or original photos sent by snail mail. I work up a sketch on the canvas. Send you images and you can give me feed back then. About a third the way to completion I send another email with your painting. Once you approve I then add the details and the emotion of your dog. I then send the final photo for your approval. Once you give me the OK full payment of the art is due. It takes 3 - 4 weeks to complete and allow the art to dry. I do like to talk with you personally to get a feel for your dog and pet and some feedback on where you want to hang the painting. I like to work in the right colors for your decor while keeping the emotional bond of your dog shining through. Please contact me with any questions. You can also give me a call. My standard prices are for one dog on a complimentary background. I ship with your painting all your photos. If you live close by I will come over and shot my own photos at no charge. Visit my shop Between The Weeds. Click Here. The dog portrait in progress, working from an emailed photo shows this oil painting is half way there. 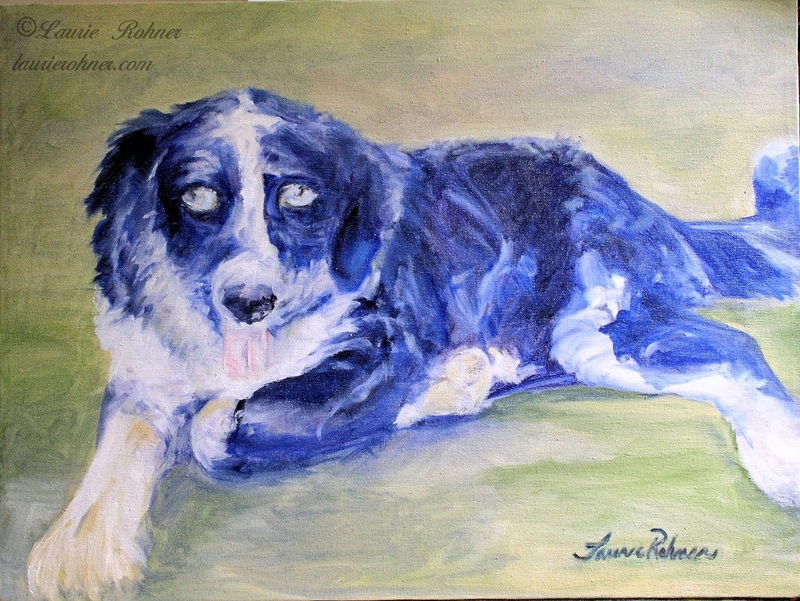 Finished dog portrait painted in colorful blues purples and whites on a soft green background. Closer look at this wonderful custom dog painting. Contact me for your custom painting today. All my work comes to you as an original oil on canvas artwork.